Different populations, or generations, of stars are thought to coexist within the cluster. The large-scale structure of the Universe is made up of voids and filaments, that can be broken down into superclusters, clusters, galaxy groups, and subsequently into galaxies. The star clusters in the universe are made up of hundreds of thousands of stars all bound together by gravity. Recently NASA/ESA Hubble Space Telescope’s Wide Field Camera 3 (WFC3) has recently captured a star-filled image that showing NGC 1866 at the very edges of the Large Magellanic Cloud, a small galaxy located near the Milky Way. However, NGC 1866 is no ordinary cluster. It is a globular cluster discovered in 1826 by James Dunlop and located in the constellation of Dorado. It is a surprisingly young globular cluster situated close enough to us that its stars can be studied individually — no small feat given the mammoth distances involved in studying the cosmos! 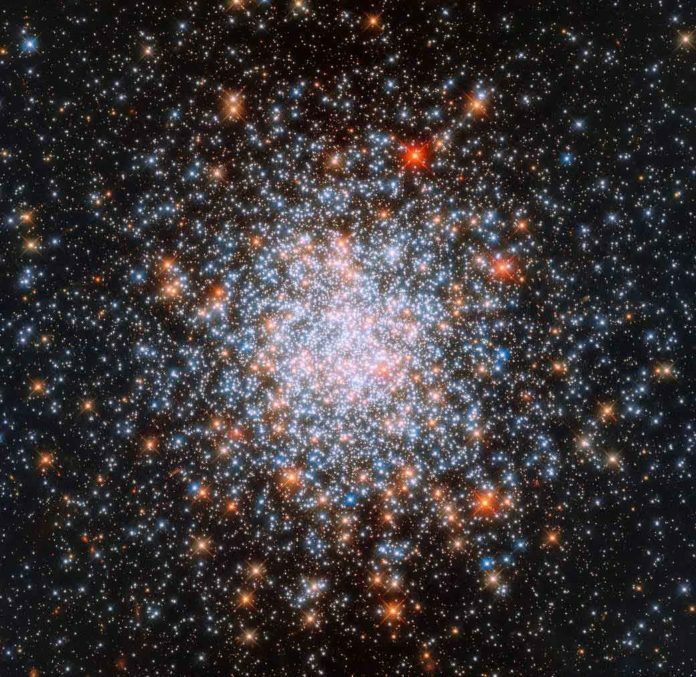 Although, there is still debate over how globular clusters form, yet perceptions, for example, this have uncovered that the greater part of their stars are old and have a low metallicity. In astronomy, “metals” are any components other than hydrogen and helium; since stars shape heavier components inside their center as they do nuclear fusion all through their lifetimes, a low metallicity demonstrates that a star is extremely old, as the material from which it framed was not enhanced with numerous overwhelming components. It’s conceivable that the stars inside globular clusters are old to the point that they were, in reality, a portion of the simple first to shape after the big bang. In the case of NGC 1866, though, not all stars are the same. Different populations, or generations, of stars, are thought to coexist within the cluster. Once the first generation of stars formed, the cluster may have encountered a giant gas cloud that sparked a new wave of star formation and gave rise to a second, younger generation of stars — explaining why it seems surprisingly youthful.